The Rebbe recited the Kel Maleh Rachamim on the steps of the Capitol on Erev Yom Kippur, 1943 when over 400 Rabbanim and Admorim marched on Washington demanding that the Roosevelt administration help save the Jews of Europe . Is this the brother of Reb Shmuel Aharon ZT”L. He is also listed on this site. The father, read the names. The Melitzer Rebbe is famous for his Nigunim and compositions in the Chasisdic world, he delivered the Kel Moleh on the steps of the Capitol in Washington DC in 1943 at the famous Rabbonim marsh in protest for the Nazi barbarism and asking the US goverment to intervine for the well being of the Jews in Europe. Cheskel, what does that mean? Reb Shmuel Aharon, was the son of R’ Itsikel. Miller, it was not on the steps of the Capitol. Whassa-dif? it was in Washington DC, where indeed was it? Cheskel, on the Kever of Rav Shmuel Aharon ZT”L, it says that he was the son of an Admor. Here it says he was the AVBDK”K of Melitz. 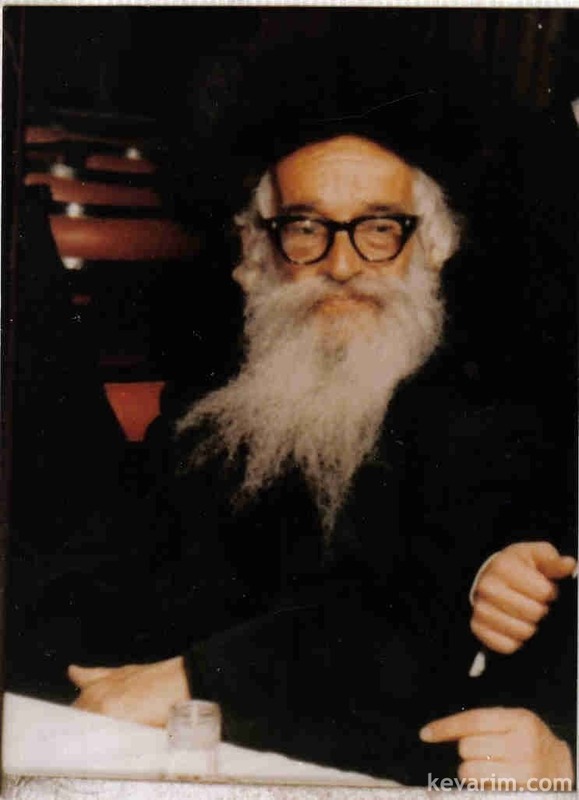 Reb Naftali of Melitz was both the Rav in Melitz and a Rebbe for Chasdim, his son Reb Yitzchok or Reb Itzikel the way he was called was a Rav in a few villages in Europe prior to his immigration, here he called himself Melitzer Rebbe. Caption: Please help identify the people in the picture. 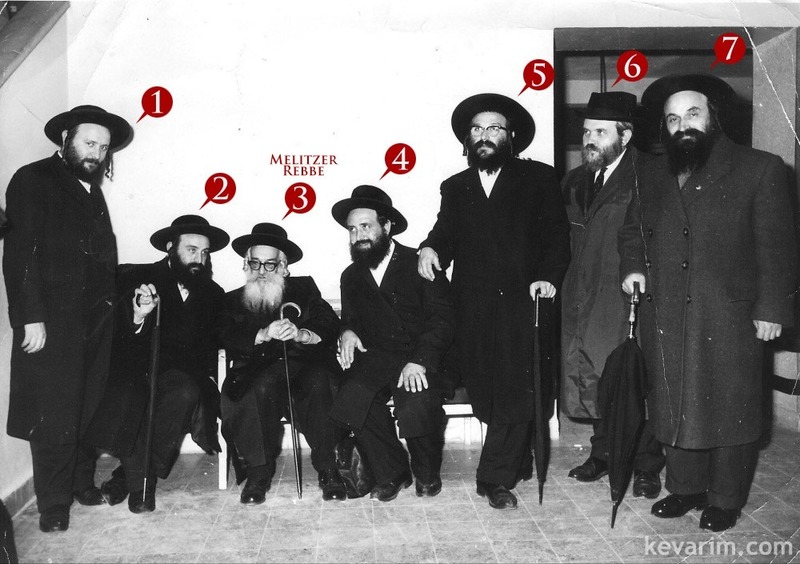 The people surrounding the Melitzer Rebbe are his nephews, sons and son-in-law of his sister the Chekever Rebetizin . He was nifter 1978 not 1975. Reb Itsikel lived on the upper west side, at least the last 25 years of his life. I am the grandson of Harav Yitzchok and the son of Harav Shmuel Ahron. Numbers 1,2, 4 and 5 in that photo are my zaide’s great nephews with the last name Halberstam. 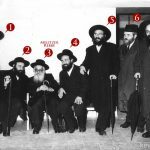 #2 is the famous harav Moshe Halberstam ZTL of the Eidah Hachreidis and #5 his brother Harav Naftali Shlita who heads the Vaad Hakashrus of the Eidah. If anyone has the scan of this photo I would greatly appreciate if they would email it to me. Thank you. Do you know if there are any yuhrzeit seudos held to remember the Kedushas Naftali and/or the Birchas Yitzchok – here in the US? 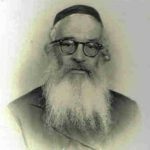 If you are the grandson of Reb Itzikel, why do you not continue the glorious tradition of your royal zaidas and open up a Melitzer shtiebel or Bais Medrash? If you do not feel worthy, then maybe your son or son-in-law would be willing? 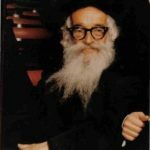 NEED HELP in family connection to Reb Yitzchok Horowitz, OBM. My grandmother, OBM, Channa Gittel Krieger was a cousin to Reb Yitzchok. I remember being taken to the Rebbe’s home & Shtiebel on Riverside Drive in the late 1940’s for Slichose and sat upstairs with the family for dessert. My grandmother’s maiden name was Hollander and thru her I am a Rupshitzer aynnikle. My father, OBM, was Avram Abba Krieger. Looking for family connection to Melitzer and his direct link to Rupshitzer. I remember your Father as a child, I was born 1941. I also seem to remember a daughter when I was taken to your Grandfather’s home back in 1947 thru 1951. My memory is quite clear on how your Grandfather appeared when he came down to the Bais Medrash to start Slichot. Please get back to me so we can speak aboput our shared Rupshitzer Yichus. My fourth great grandfather’s name is Shmelke Hasid reb Itsikel. 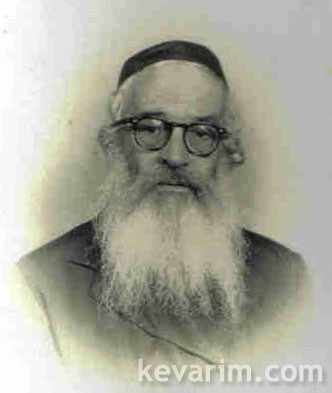 He was a close follower of the Seer of Lublin sent by the latter to Moshe Teitelbaum to Ujhely at the beginning of the 19th century. Can anyone help me with more information? I popped in on this site because there was a mentioning of some R’Itsikel. So I thought there might be a link. I am the younger of R’ Shmuel Ahron’s two sons. Maybe we can speak at an opportune time. I don’t know how to contact you. I am the granddaughter of R’ Yitzchok Horowitz, the Melitzer Rebbe. My mother was Raizel Sarah, one of his four daughters [there was also one son, Shmuel Aharon]. Naftali and Reuven Horowitz are my first cousins. I would be interested in any pieces of information or zichronos about my grandfather, especially the 1943 Rabbis March. We grandchildren have a wealth of memories that we would be happy to share. Thank you Reuven and Miral Simch for responding. Shanna Tova wishes to both you and your family. I’m sorry for not responding sooner. Until just now I had not returned to your beloved Melitzer Rebbe’s page. You can contact me either via e-mail, warrior23@aol.com or phone 305 864 1501. I await further contact from either one or both of you. Whew! I just returned to this page by Mistake. I ,as well would love any information. Was there a recording of my grandfather singing at the White house? I see one daughter was Biela Rubin, who was her husband? Biela’s husband was R’ Simcha Rubin, Rav of Lantzheter Shteibel in Queens, NY.